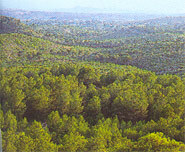 The Calderona sierra is a constant backdrop for scenery in the Valencian districts of L'Horta, El Camp de Túria, and El Camp de Morvedre. It serves as a dividing line between the Palancia river basin to the north and the Turia and Carraixet river valleys to the south. It is rugged terrain composed of Triassic sandstone and limestone soil in which numerous cluster pines and some cork oaks take root. The highest point is the Gorgo summit (907m), accessible from either Gátova or Olocau. The Garbí summit (601m), accessed from Naquera and Serra, or from Segart, is a magnificent lookout point over neighbouring districts. Its tranquil valleys provide shelter for historical religious communities such as the Cathusians of Portaceli (Serra), Vall de Crist (Altura) and the Franciscan convent of Sant Esperit (Gilet). The Long-Distance Hiking Route GR-10 and a network of Short-Distance Routes enables hikers to enjoy these fine surroundings.